and one bullet changed everything. BAGHDAD, Jan. 28 — Staff Sgt. Hector Leija scanned the kitchen, searching for illegal weapons. One wall away, in an apartment next door, a scared Shiite family huddled around a space heater, cradling an infant. After Staff Sgt. Hector Leija was shot in the kitchen of a Baghdad apartment last Wednesday, Pfc. Aaron Barnum retrieved the sergeant’s helmet. It was after 9 a.m. on Wednesday, on Haifa Street in central Baghdad, and the crack-crack of machine-gun fire had been rattling since dawn. More than a thousand American and Iraqi troops had come to this warren of high rises and hovels to disrupt the growing nest of Sunni and Shiite fighters battling for control of the area. The joint military effort has been billed as the first step toward an Iraqi takeover of security. But this morning, in the two dark, third-floor apartments on Haifa Street, that promise seemed distant. 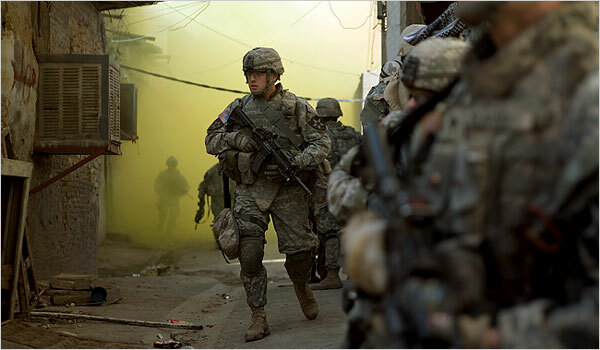 What was close, and painfully real, was the cost of an escalating street fight that had trapped American soldiers and Iraqi bystanders between warring sects. And as with so many days here, a bullet changed everything. It started at 9:15 a.m.
“Sergeant Leija got hit in the head,” yelled Specialist Evan Woollis, 25, his voice carrying into the apartment with the Iraqi family. The soldiers from the sergeant’s platoon, part of the Third Stryker Brigade Combat Team, rushed from one apartment to the other. In the narrow kitchen, a single bullet hole could be seen in a tinted glass window facing north. The platoon’s leader, Sgt. First Class Marc Biletski, ordered his men to get down, away from every window, and to pull Sergeant Leija out of the kitchen and into the living room. “O.K., everybody, let’s relax,” Sergeant Biletski said. But he was shaking from his shoulder to his hand. Relaxing was just not possible. Fifteen feet of floor and a three-inch-high metal doorjamb stood between where Sergeant Leija fell and the living room, out of the line of fire. Gunshots popped in bursts, their source obscured by echoes off the concrete buildings. Two minutes later, three soldiers rushed to help, dragging the sergeant from the kitchen. A medevac team then rushed in and carried him to a Stryker armored vehicle outside, around 9:20. He moaned as they carried him down the stairs on a stretcher. The men of the platoon remained in the living room, frozen in shock. They had a problem. Sergeant Leija’s helmet, flak jacket, gear and weapon, along with that of at least one other soldier, were still in the exposed area of the kitchen. They needed to be recovered. But how? “We don’t know if there’s friendlies in that building,” said Sgt. Richard Coleman, referring to the concrete complex a few feet away from where Sergeant Leija had been shot. Sergeant Biletski, 39, decided to wait. He called for another unit to search and clear the building next door. The additional unit needed time, and got lost. The men sat still. Sergeant B, as his soldiers called him, was near the wall farthest from the kitchen, out of sight from the room’s wide, shaded window. Sergeant Woollis, Private Barnum, Sergeant Coleman and Specialist Terry Wilson sat around him. Together, alone, trapped in a dark room with the blood of their comrade on the floor, they tried to piece together what had happened. Maybe the sniper saw Sergeant Leija’s silhouette in the window and fired. Or maybe the shot was accidental, they said, fired from below by Iraqi Army soldiers who had been moving between the buildings.